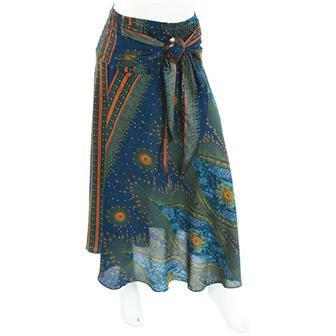 Our skirt section is jam packed with bohemian beauties and Fair Trade finery in all manner of materials and styles. Go with the long length wrap around for the hip gypsy vibe or the utility for something pretty and practical. 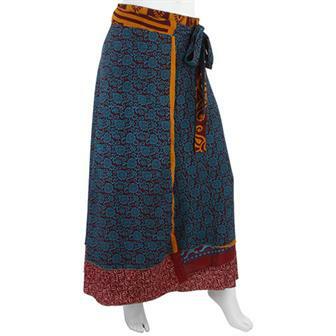 Also available here are our traditional sarong designs from Indonesia. 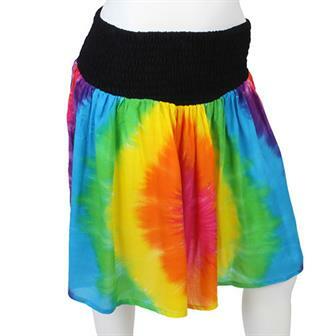 These adjustable popper skirts come in a wide range of vividly bright and exciting colours and patterns. Each one also features a handy side pouch with two pockets. One size. Assorted colours and designs. 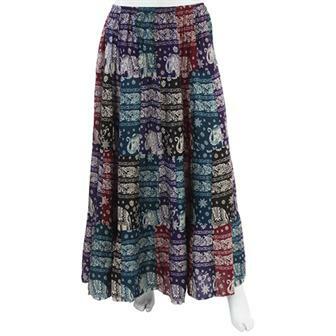 Lovely and long, perfectly patchwork, these charming skirts are made from a selection of off cut elephant fabric. 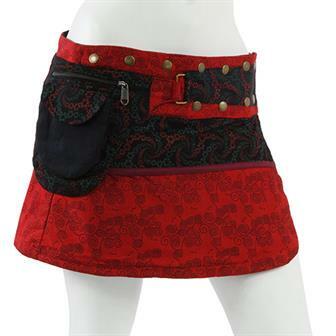 Each skirt has an elasticated waist for extra comfort. 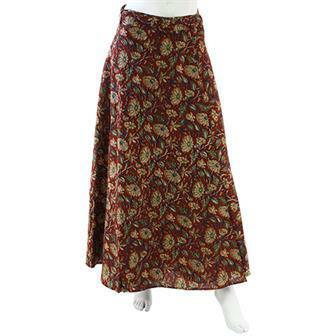 Long wrap around cotton skirt, with simple ties made from beautiful block printed Indian fabric in Jaipur. The fabric is made using the same techniques used to make large Indian Bedspreads. This long serving classic product is a winner for summer, available in three colours. Based on a traditional Indian quilt making style known as Kantha, these fantastic skirts are eye catching and colourful. Each skirt is slightly different due to the hand manufactured techniques. 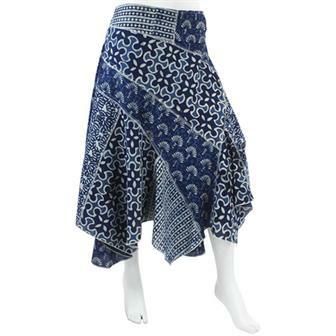 The beautiful patterns on these lovely skirts are made using the traditional Indian block printing method and the dye used for these skirts is natural Indigo. This is derived from a flower that has been grown for dyes in the Indus valley (where it is named after) for many centuries. These beautiful cotton wrap around skirts are made in a printed material inspired by the traditional designs of the Hmonng hill tribe in Northern Thailand. Strikingly made from various strips of floral fabric and then arranged diagonally, these pointy hem skirts are a subtle and classy garment. 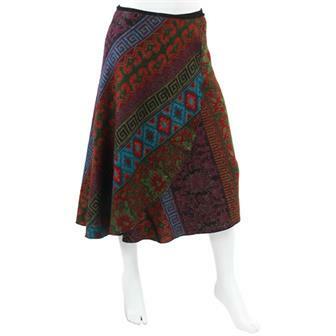 These vividly patterned skirts are made in our soft, brushed acrylic material. 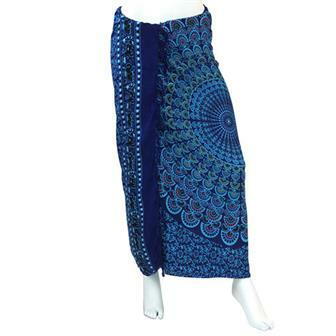 Their wrap around design is one size fits all and incredibly easy and comfortable. These beautiful skirts are made from flowing, lightweight sari material; they make excellent summer skirts for celebrating the sunshine. 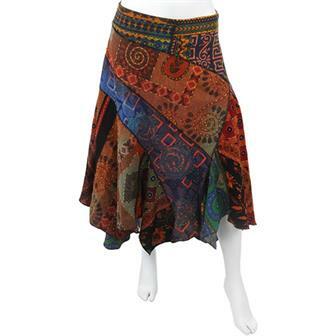 These skirts come in a wide range of unique patterns and colours so bear this in mind when ordering. Fabric patterns and colours will vary. 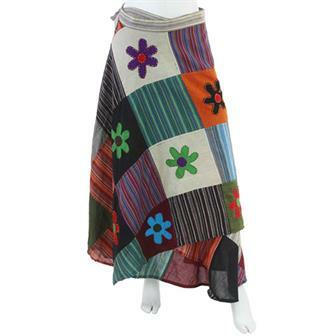 These comfortable and colourful wrap around skirts are part of our exciting range of Nature's Dye clothing. Handmade in India, these great items use only natural dyes to create beautiful, eye catching patterns. These trendsetting, 60's inspired skirts are kalaidoscopic in their colouration and will truly make an impact at any festival or party. 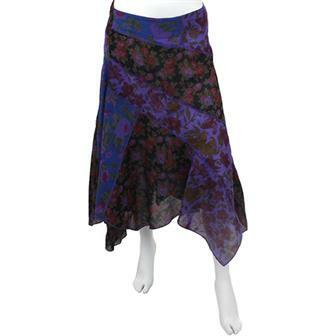 The vividly bright skirt is off set by the black elasticated waist, highlighting the psychedelic tie dye even more. 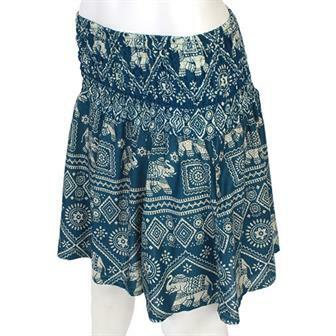 These super lightweight Thai elephant skirts come in a variety of colours and patterns and are perfect for donning on hot, sunny days. 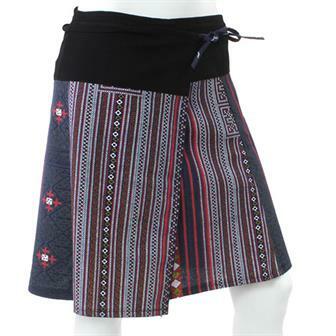 These wonderfully eye catching skirts are made in a patchwork style from the off cuts of our other Thai clothing ranges. This means that your beautiful fusion skirt will be completely unique! 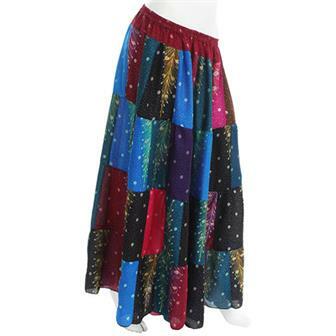 These wonderful full length skirt are made in lightweight rayon material in a beautiful peacock feather design. Each skirt is finsihed with a polished coconut buckle tie belt and an elasticated waist band. Available in a selection of colours. Gorgeous wrap around skirt with bright flower decorations. Each skirt is wonderfully unique due to the beautiful patchwork material used. Intensely detailed and colourful, these silky soft, rayon sarongs are an essential bit of kit for any journey to the beach!